This is the third part of a series on how to use the Omnimaga forums. If you're new here, hi and welcome to Omnimaga! Be sure to post in the Introduce Yourself! board. You may want to tell another member something private, or just carry on a conversation with them. One way to do this is to send them a private message, also known as a PM. To send a PM, hover over "My Messages" on the Omnimaga header and click on "Send a message." 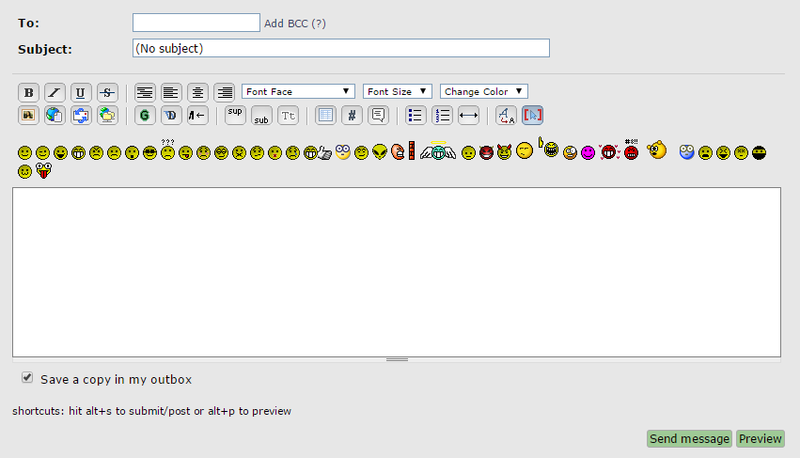 You can then use the post editor-like interface to type out the message you want to send. Don't forget to add a subject! Click "Send message" at the bottom of the page to send the message. To check your inbox and see what messages you have recieved, hover over "My Messages" on the Omnimaga header and click on "Read your messages". The page that comes up will show all of the messages that you have recieved in a list. If you want to reply to the message, click "Reply" at the top right corner of the message you recieved. That's it! Sending and recieving PMs is an easy way to communicate with other members. It might be good to point out some other PM system features. For example, how to use PM search properly and what it can't search, and the report to admin feature when members receive spam or other unwanted messages. Page created in 0.237 seconds with 36 queries.